"They were amazing last night. Best improv troupe I've ever seen! And in 30 years, I've seen a lot. 11 maybe 12." "You are so lucky to have an improv group like CRUMBS here in Winnipeg,"
Both Sim and White seem to think with one hilarious brain. They transform audience suggestions into complex story arcs and characters with nearly fully-formed identities. 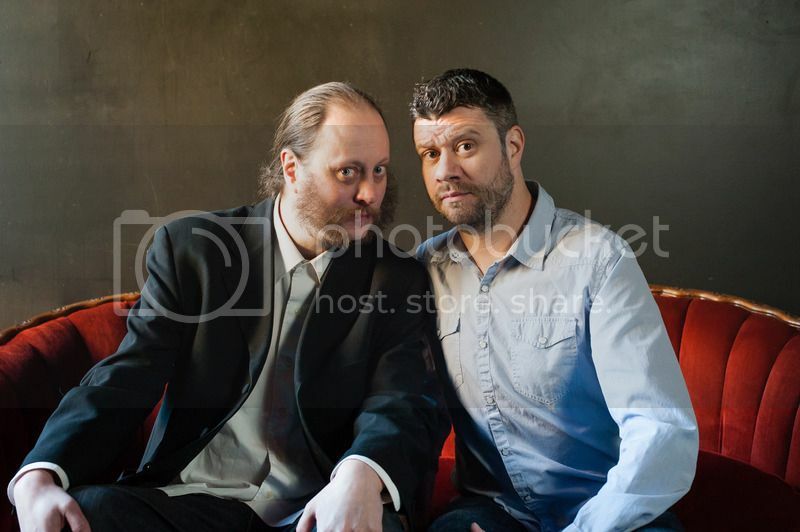 While a handful of jokes land squarely below the belt, the duo manages to avoid vulgar territory. Prepare to laugh a lot but also be strangely moved by touching moments between Sim and White; neither of whom shies away from exploring a little sincerity. In one hour, from nothing but two audience suggestions, they create real characters who feel fleshed out and worth caring about, aided greatly by the musical cues of Tyler Sneesby, a.k.a. DJ Hunnicutt, whose subtle contributions heighten every scene. 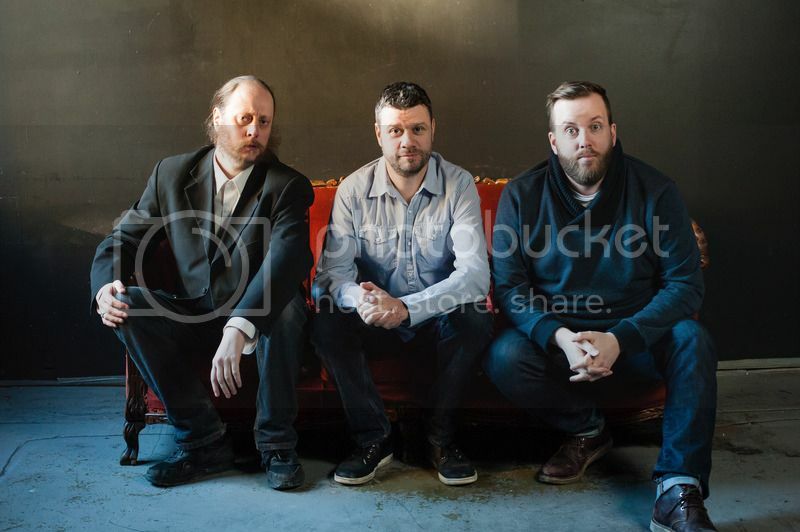 Watching these three masters play off and anticipate each other will spoil you for lesser improv. "If you’re a Winnipegger and a fan of improv, hopefully you’ve already booked your tickets for Crumbs. 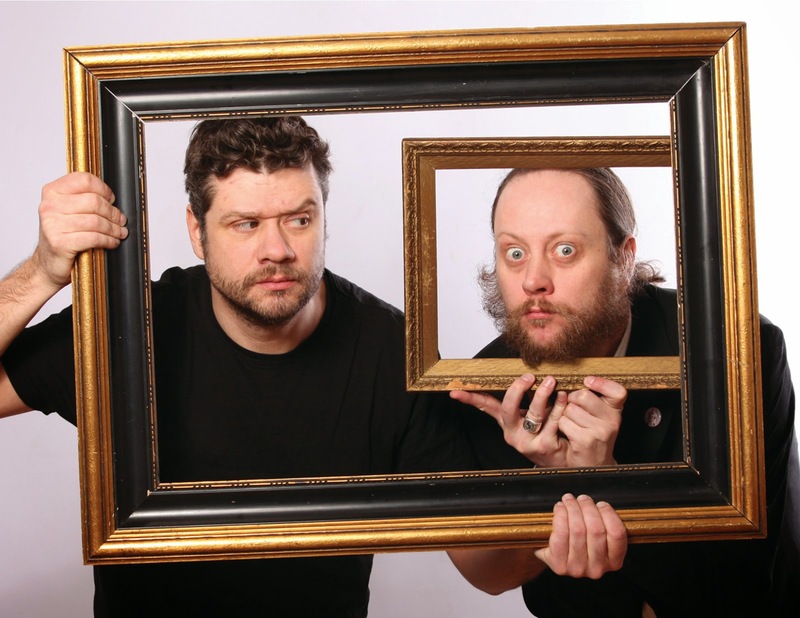 Grizzled veterans of the festival, Stephen Sim and Lee White are back for their 17th fringe in a row. You don’t sell out fringe shows for that long without being consistently excellent and this year’s show, Made Up Truths, is no exception." "Stephen Sim and Lee White, along with their computer guy, DJ Hunnicutt (Tyler Sneesby), seek truth in comedy when they invite their audience to offer a true story as inspiration for the Crumbs improv goofiness that follows. They then proceed to decimate the truth as you know it, killing their hometown audience in the process." "The audience crumbled with laughter." 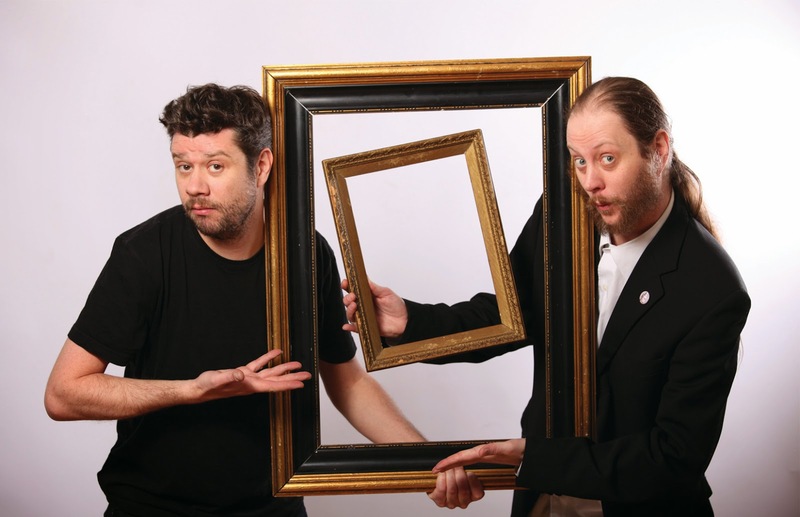 "Stephen Sim and Lee White (accompanied and enhanced by the mad musical improv skills of DJ Hunnicutt) put on a solid, funny show. Every time. No matter what.You will laugh.You won't be able to help it." "These performers have been working together long enough to have an ease and intuitive understanding of each other, yet still surprise each other, and the audience.Their comedy is sharp, fast, and without boundaries, but never malicious." 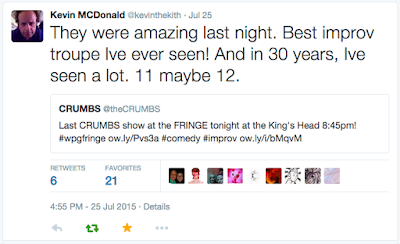 "I've seen CRUMBS more than a few times in my almost 20 years of Winnipeg theatre going, & they've never failed to bring the funny. Not once." "Players Stephen Sim and Lee White are joined by DJ Hunnicut, who reads these two almost as well as they play off each other, and assembles a scene-specific musical score on the spot. For comedy buffs, it’s a joyride. For improv students, it’s even better -- they could save tons o’ cash on lessons just by watching these guys do their thing." 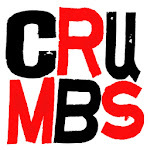 That's what Crumbs theatre is all about, it's lightning in a bottle. They're the only theatre troupe that doesn't make me gag at the word "improv." It's because I laugh so hard every time I see them. I'm talking abs-hurting-tears-in-my-eyes kind of laugh. Steve Sim and Lee White work together on stage like virtuoso jazz musicians, reading each other for cues and subtly reminding the other of where they've been with their invented characters. DJ Hunnicutt is behind the wheels of steel providing the improvised soundtrack and his choices heighten the feel of each skit without clamouring for attention. This year, they've raised the stakes a bit by adding video. Hunnicutt has the added job of choosing an appropriate visual background. Even when it doesn't go as planned, it still works. In one of the skits, a supposed lion hunt, Steve looks back at the jungle backdrop and asks why they aren't in the Savannah. This leads Lee to confess that he doesn't know what he's doing and that he's really only trying to impress his father. This is what Crumbs do, whatever happens they go with it and make it funny. 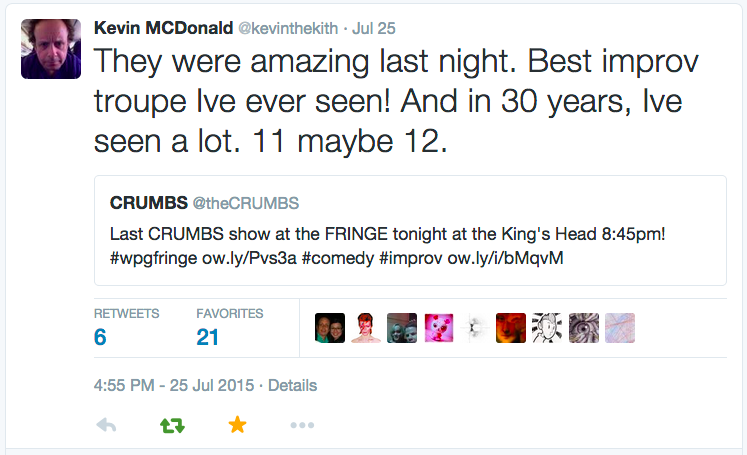 After years at the fringe, Crumbs are still at the top of the game and seem to be as popular as ever. There are probably people lined up for the next show at the King's Head right now. Recommended if you are old enough to stay up late.